Judy Martin (left), Milt Diamond (second from left) and Jo Anne Darcy (right) of the Newhall Walk of Fame (W.O.F.) committee, later known as the Walk of Western Stars, flank actor Dennis Weaver upon his induction in 1984. His bronze plaque is located at the southeast corner of 8th and Main Street. 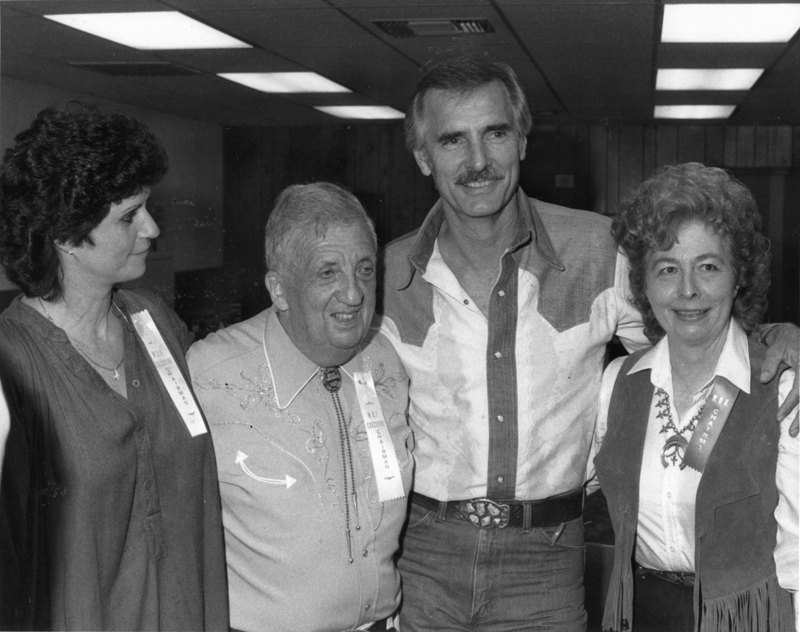 This same year (1984), Diamond and Darcy were named SCV Man and Woman of the Year. Weaver, Martin, Diamond and Darcy are in the office of the Newhall-Saugus Chamber of Commerce, later known as the SCV Chamber. At the time, the 1880s-era building, which had served as the SCV Boys Club office ("Girls" came later) and before that, the Pacific Telephone exchange, was located at the "triangle" formed by Newhall Avenue, Walnut and Market streets. The building was moved down the street to Heritage Junction at Hart Park in 1992. This is three years before the City of Santa Clarita came into being and Darcy was elected to the first City Council. Here, she was executive director of the Chamber of Commerce and did the heavy lifing for the Walk of Fame er, Western Walk of Stars committee. Judy Martin and husband Bob Martin owned the NAPA Auto Parts store on San Fernando Road (Main Street) that later became the Canyon Theatre Guild's theater space. They were active in the Downtown Newhall Merchants Association and ran the Fourth of July Parade until DNMA dissolved in the mid-1990s. Milt Diamond ran the Newhall General Store at the corner of 8th Street and San Fernando Road (Main Street), where Weaver's WOWS plaque is located.